July 28, 2014 – At 03:59 the SHFD was dispatched to 302 Randal Street, North Manheim Township for an automatic fire alarm. Crews arrived on scene and found a faulty detector. Units were on scene for approximately 20 minutes. Chief 723 (Motko) had command. July 26, 2014 – At 22:30 Station 4 was requested for Engine 737 by Chief 41 (Cressona) to the area of the Gordon Nagle Trail and Mengle Street, North Manheim Township for a working vehicle fire impending on a structure. The bulk of the fire was knocked down by crews from 41-17, just before Engine 737 arrived on scene. Station 4 assisted with checking the building exposure for extension. Engine 737 and Tanker 738 were on scene for approximately 25 minutes until being released by Chief 41. 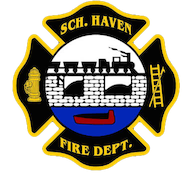 July 23, 2014 – As heavy storms and severe lightening moved through the area, at approximately 16:39hrs the Schuylkill Haven Fire Department was dispatched to 213 Saint Peter Street for a house fire. Chief 723 (Reed) arrived on scene and advised of a working attic fire. E-732 was the first to arrive on scene and initiated an interior attack on division III. E-737 tagged a hydrant at the bottom of the Market Street hill and dropped 600 ft. of LDH to the scene. Ladder 725 placed the aerial in service on the D side of the structure and conducted roof ventilation. Due to an aggressive attack, the bulk of the fire was knocked down within 20 minutes. Crews remained on scene for approximately two hours and performed overhaul and salvage operations. June 2, 2014 – At 13:00hrs Station 4 was dispatched for Tanker 738 as part of a Tanker Task Force for a working structure fire at the address of 18 Spruce Street, Pine Grove Borough. Personnel from Station 4 assisted with fire suppression, establishing a water supply, and overhaul operations. Tanker 738 also hauled 6,000 gallons of water to the scene. The incident went a total of 3 Alarms. 58-06 had command. May 30, 2014 -At 08:30 Stations 2 & 4 were dispatched to the area of 1297 Schuylkill Mountain Road for an unknown type fire. As units became en-route, Chief 723 (Reed) arrived on scene and was met with a fully involved house fire at the address of 30 Shue String Lane. Chief 723 immediately upgraded the assignment to a working fire, and requested a Tanker Task Force. Crews from the SHFD arrived on scene and performed an exterior attack (surround and drown) using multiple master streams. The fire was shortly brought under control. Crews remained on scene for overhaul operations and by the request of PSP. At 13:04, while units were still on the scene of the previous structure fire, SCCC transmitted an alert for a house fire w/entrapment at 421 E. Main Street, in the borough. Tower 519 (Minersville) and Engine 58-10 (Pine Grove) were on stand-by at the Schuylkill Hose and immediately responded to the scene to find heavy smoke showing from the residence on the address side of the building. The first in crews stretched lines and began a primary search. The fire was controlled and knocked down within minutes. Chief 720 (Donatti) arrived on scene and took command of the incident. Sadly, there were 2 civilian fatalities due to the fires on this day. Our thoughts and prayers are with the families of the victims and our fellow firefighters. The SHFD would like to thank all of those who assisted the department; this includes those who came out of retirement to help establish the initial water supply on Main Street. The SHFD would also like to thank all of the surrounding fire companies for their support and mutual aid. Out of respect for the families there will be no photos posted. May 10, 2014 – At 17:53 the SHFD was dispatched to the area of 303 Manheim Road, North Manheim Township for a vehicle accident with possible entrapment. Crews arrived on scene to find a head-on collision with 1 injured patient still inside the vehicle. Fire personnel performed stabilization of the vehicles and assisted EMS with removing and packaging the injured patient. All vehicles were secured and floor absorbent was applied to the roadway to contain the fluids. Chief 720 had command. Photos via Engine 737. April 12, 2014 -At 18:10 Stations 1 & 4 were dispatched along with Fire District 41 Cressona Fire, to the intersection of Pottsville Street and Columbia Avenue, Cressona Borough for a reported house fire. Crews arrived on scene to find a two-story single family dwelling with smoke showing to the rear. Fire personnel assisted with fire suppression, overhaul and numerous animal rescues. All units were on scene for approximately 2 hours.